For the second year in a row, the Colorado Springs Sky Sox have partnered with Care and Share Food Bank, Springs Rescue Mission and Catholic Charities of Central Colorado's Marian House as part of their region-wide community turkey drive for the 2014 holiday season. "The Sky Sox are proud to partner with this incredible group of Colorado Springs community partners in an effort to make a significant impact this holiday season," said Sky Sox President and General Manager Tony Ensor. "We are truly thankful to be a part of this community and this effort to help those most in need. We hope that the citizens of Colorado Springs will come out in large numbers to support this worthy cause and drop off their contributions as Security Service Field." Those interested in donating a frozen turkey can do so at Security Service Field on Friday, November 14 between the hours of 7:30 a.m. and 6:00 p.m. 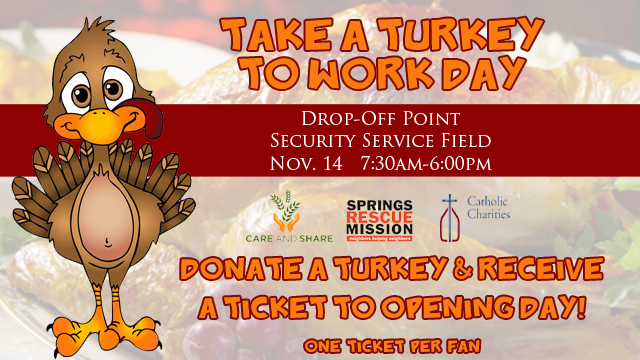 The Sky Sox will also be providing one free ticket to Opening Night 2015 (Thursday, April 9) to anyone who donates a turkey at Security Service Field on November 14. Additional drop off locations include Springs Rescue Mission, Calvary Worship Center or Compassion International. "It is only through collaborative community efforts can we accomplish a goal of feeding our neighbors in need," said Lynne Telford, CEO Care and Share Food Bank. "By combining our efforts to meet the needs we hope to provide more turkeys, the Thanksgiving centerpiece, this holiday season." "We at Springs Rescue Mission are excited to continue our partnership with Care and Share, Catholic Charities, media partners, Panera Bread, and Sky Sox Baseball to help families through the 10,000 turkey effort," said Springs Rescue Mission President & CEO Larry Yonker. "Our wonderful and caring community consistently shows its generosity and we believe that they will again display their goodwill and enable this partnership to exceed its goal." "Catholic Charities of Central Colorado is thrilled to join the collaboration with Care and Share, Springs Rescue Mission, and the many partners and community members who are instrumental in providing help and creating hope to those in our community who need it the most. Something as simple as providing a turkey means so much to those we serve. It allows many families and individuals to celebrate a traditional holiday, and all that goes with it, who otherwise would not be able to," said Rochelle Schlortt, Catholic Charities Chief Communications Officer.